“When my husband of 34 years died I lost my interest in cooking. Instead I began relying on quick frozen organic entrees and dinners. After three years I decide to improve the quality of my diet, so I contacted Robin Mallery. 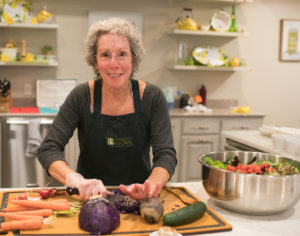 Robin helped me create a more nourishing and healthful diet that took my busy teaching and consulting schedule into consideration. Services: Ike’s cuisine is that of Louisiana, New Orleans to be specific. They chose New Orleans because the food is warm, tasty, and delicious, in addition to reflecting the melting pot that is New Orleans, with a Cajun foundation, and diverse ethnic contributions. Ike’s is certified with the Green Restaurant Association, as is reflected in their choice of free-range meats, and organic flours, grains, produce, eggs, and dairy products. The to-go containers and cutlery are recyclable and biodegradable. At Ike’s, the belief is that good quality food and the attitude in which it is prepared makes for a happy belly. Robin’s Thoughts: From the lovely outdoor patio, to the friendly atmosphere, to the amazingly diverse menu with many items being vegetarian variations on classic New Orleans style dishes, Ike’s is one of our community’s favorite restaurants. I love that the veggies are organic and local–my favorite is the gingered greens. Last time I had lunch there, the grilled tempeh, mushroom, and gorgonzola sandwich was rich with fabulous flavors and textures. Ike’s offers breakfast, lunch, and dinner–they are busy most of the time, allowing you to settle in for a good visit with your meal mate. Services: Rather than baking with the commercial/industrial methodology of using manufactured mixes and artificial flavorings, Flour Garden bakes with a special blend of classical European-style and California health consciousness. Combining this blend of quality and beauty is labor-intensive and time-consuming. Everything is made from scratch. It is also much more costly to bake with the finest quality, most nutritious, ingredients; but the Flour Garden is determined to produce food that is not only delicious, but also nutritious. It is also the Flour Garden’s intention to serve the community by providing a “well-lighted place” where everyone will feel welcome and cared for. On any given morning, one would find a rich blend of the local populace: Republicans and Democrats, students, doctors, school teachers, construction workers, local law enforcement officers, artists. There is a children’s area with a smaller table and chairs, and children’s books. There are handicapped-accessible restrooms. Classical music, usually. Or jazz. All of these reflect a welcoming and serving of the community as a whole. Robin’s Thoughts: I have long appreciated Flour Garden! There are so many choices, depending on your mood and time of day. My personal favorites: organic peanut butter on a whole grain toasted bagel, coconut macaroons, pumpkin muffins, hot chai and ginger cookie (a must have combo–especially in the winter! ), frittata (great for a quick lunch), to name just a few. I have ordered special-made cakes and have been appreciative of the real frosting, as opposed to the artificial stuff offered at other bakeries; numerous pies for the holidays; and the bread, oh my, the bread–something as special as the edible bread basket for Thanksgiving, Tibetan multi-grain, seeded baguettes, I could go on and on. A new addition to the offerings at Flour Garden are a line of Gluten Free breads, goodies, and soups. This is yet another reflection of the commitment that Susan and Bill have for the health and well-being of our community. I must also mention the daily soups — made from scratch, absolutely delicious, many are vegetarian and/or vegan, and they are all for eat-in or take home. Flour Garden is fully engaged in our community. Susan and Bill generously donate their wares to various organizations as well as sponsor fund-raising events. The ambiance provided at their bakeries is inviting and comfortable. Their commitment to our physical health as well as to the health of our world is to be acknowledged and to be thankful for. Flour Garden combines flavor, satisfaction, and consciousness in a way that is a treat for all.